Texas Hold'em poker table, 1000 poker chips, poker chip aluminum case, 2 decks of Copag poker cards, dealer button, little and big blind buttons. With this set up you will be able to host some great poker tournaments and parties for up to 10 players as often as you wish. 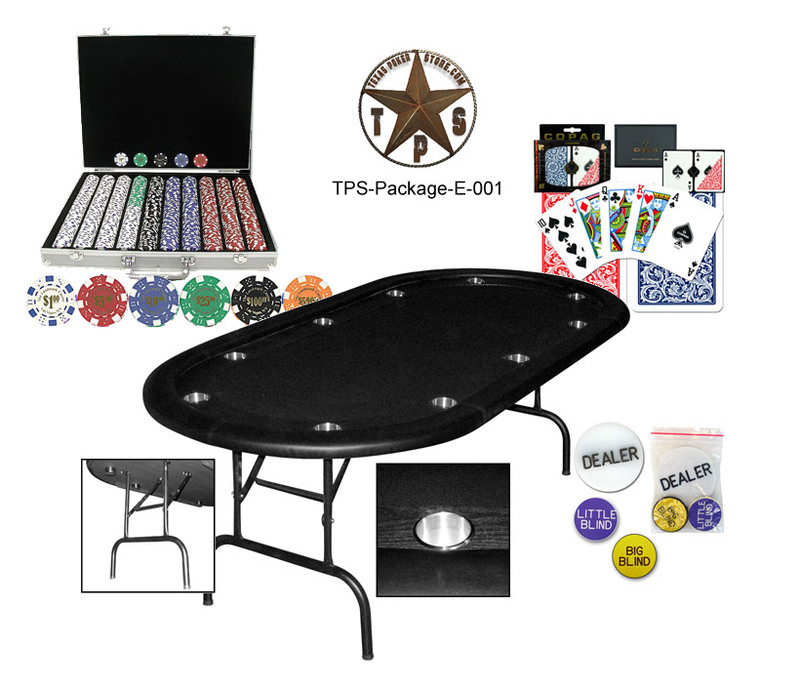 To get you playing poker as soon as possible, we have included a Texas Hold'em poker table (42 x 84 x 30 inches) in this package that is guaranteed to bring style and status to your game! With metal frame and folding legs this great table will hold up for a lifetime of play. The gaming surface features a black veneered racetrack, high grade black felt, 10 stainless steel cup holders, and mildew resistant black vinyl rails. With a table like this you can take your game to the next level. These 1000 "Casino, Las Vegas" inlaid coin chips are some of the most unique you will ever see. The coin inlay poker chip became popular in many worldwide casinos. Six different denominations complete this chip set, including $1, $5, $25, $100, $500, & $5000. Each denomination has its own color. Also engraved in the coin of each chip is each card suit. This chip case has a heavy duty lightweight aluminum available in brilliant silver. The interior is wood structure lined with black felt with a 1000 chip capacity and keys for the locking clasps. Treated properly this chip case will last you a lifetime. A set of Copag™ Poker Size REGULAR Index - Blue*Red Setup. These cards are made from a exclusively engineered PVC plastic which can handle the wear and tear of normal games, outlasting paper cards up to 500 times. Completely washable, you don't need to worry about soiled cards. A quick wipe with a damp washcloth, then dry and they are ready to go. Each set comes in its own hard plastic case for storage. Whether you play solitaire, have a kitchen table game or manage a card room - once you try Copag, you will never use any other cards again. The set also includes a poker button set with a 2" diameter dealer button and a little and big blind button. This package will be delivered to your door by freight because of the size of the table. When selecting this item please select the LTL Freight Option and all the other items will be included in the same freight shipment. You will be charged $159.00 for everything that is included in this package to be shipped to any destination in the continental USA.